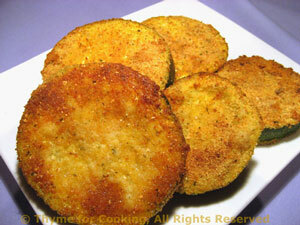 Baked Zucchini (Courgette) Rounds, Thyme for Cooking summer vegetables. Similar to the Courgette Sticks, these are made with the cute, round, 8 Ball Zucchini. I used 2, a wee bit larger than a tennis ball, and made 3 slices out of each. I didn't turn them. In a flattish bowl whisk the mustard, Worcestershire and the egg together. In another flattish bowl or plate mix the crumbs, Parmesan and chili powder together. Dip both sides of the rounds into the egg, then the crumbs. Place on a nonstick baking sheet. Bake at 400F (200C) for 35 minutes, until coating starts to brown.